Slit the breasts, on the side, lengthways and butterfly them open. Season with Lemon & Black Pepper Seasoning and coat with olive oil. Briefly cook in a non stick frying pan. Remove from the pan. Cover and leave at room temperature. Sauté the onion in the remaining oil until soft and golden. Add the cinnamon, cumin and turmeric. Cook over low heat, stirring to prevent the spices from scorching, for about 30 seconds. Add the Tomato & Chilli Sauce, Chicken Stock Concentrate, water and couscous. Bring to the boil for 2 minutes and leave to stand for 5 minutes. Slice the chicken into fine slices against the grain. Fork the chicken through the couscous. Season to taste with Green Onion Seasoning. Reheat briefly. Sprinkle with toasted almonds and drizzle with honey. 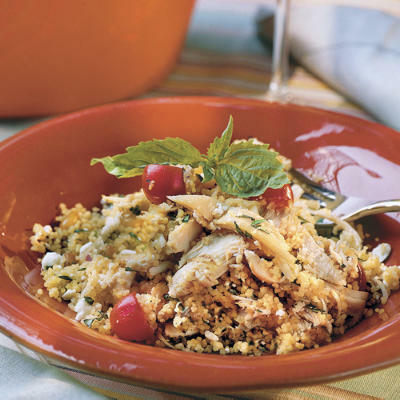 This entry was posted on June 25, 2010 at 8:49 am and is filed under Cooking, Family, Friends, People, Personal, Recipe with tags Chicken, chicken stock, coucous, cumin. cinnamon, green onion, tumeric. You can follow any responses to this entry through the RSS 2.0 feed. You can leave a response, or trackback from your own site. wow, tremendous, couscous is the main dish in my country ; well done. Oh yum can’t wait to do this recipe. Thanks!